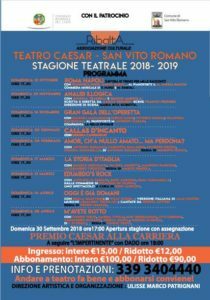 IL TEATRO CAESAR DI SAN VITO ROMANO RIAPRE L’ATTIVITA’ IL 30 SETTEMBRE 2018 CON LA PRESENTAZIONE DELLA STAGIONE 2018/2019 E L’ASSEGNAZIONE DEL PREMIO CAESAR ALLA CARRIERA. QUEST’ANNO IN CARTELLONE CI SARANNO 9 SPETTACOLI IN ABBONAMENTO E 2 EVENTI : NATALE IN CASA CUPIELLO E UN CONCERTO MUSICALE DEDICATO A FABRIZIO DE ANDRE’. 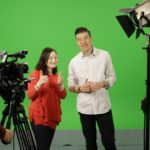 TRA GLI INTERPRETI DEGLI SPETTACOLI SI SEGNALANO: ALESSANDRO BENVENUTI, MARCO SIMEOLI, , PAOLA QUATTRINI, GIORGIA TRASSELLI ED ANTONELLO FASSARI . NOVITA’ PER LA STAGIONE UN OMAGGIO AL MONDO DELL’OPERETTA IN PROGRAMMA IL 16 DICEMBRE CON LA COMPAGNIA “LA BELLA EPOQUE”. 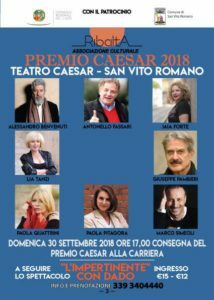 IL 30 SETTEMBRE ALLE 17,00 SARANNO A SAN VITO ROMANO PER RITIRARE IL PREMIO CAESAR ALLA CARRIERA, CONSEGNATO DAL PRESIDENTE DEL CONSIGLIO REGIONALE DEL LAZIO ON.LE DANIELE LEODORI: PAOLA PITAGORA, PAOLA QUATTRINI, GIUSEPPE PAMBIERI E LIA TANZI, IAIA FORTE, ANTONELLO FASSARI, MARCO SIMEOLI ED ALESSANDRO BENVENUTI; A SEGUIRE ALLE 18,00 LO SPETTACOLO COMICO “L’IMPERTINENTE” CON DADO. PROSEGUE ANCHE L’ATTIVITA’ DEDICATA ALLE SCUOLE, CHE PREVEDE MOLTE PROPOSTE A LORO DEDICATE CON SPETTACOLI FISSATI ALLE 10,30 DEL MATTINO. TRA LE TEMATICHE PRESENTI IL CYBER BULLISMO, L’ACCETTAZIONE DELLE DIVERSITA’, gli spettacoli per NATALE e CARNEVALE oltre la proposta in inglese RAIMBOW. 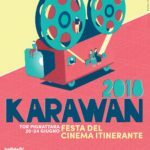 L’ASSOCIAZIONE CULTURALE RIBALTA PROSEGUE PER IL QUINTO ANNO LA COLLABORAZIONE CON IL COMUNE DI SAN VITO ROMANO, AUGURANDOSI UNA CRESCENTE PARTECIPAZIONE DI PUBBLICO ANCHE DAI COMUNI LIMITROFI, GIA’ MOLTO ATTENTI ALLE PROPOSTE CULTURALI DEL TEATRO CAESAR.